In support of Yahoo's global brand “It Starts With Y!ou” campaign, Yahoo team added some audibles and Avatars to Yahoo! Messenger. To access the audibles, click on the Audibles icon in the IM window, click “More Audibles”, go to “See All Audibles”, then find “Yahoo! Yodels” in the list. Audibles are available for Yahoo! Messenger 8.1, 9.0 and 10 only. 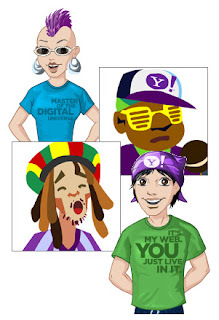 You can also dress up your Avatar in some of the latest Yahoo! gear, including t-shirts with the slogans from the campaign: “It’s my Web, you just live in it” and “Master of the Digital Universe”. To get changed, head over to Yahoo! Avatars, click on the “Branded” tab, then click on the “Yahoo!” link.